Chandigarh,Kulbir Singh Kalsi:-Keeping in mind the fact that India is facing huge shortage of doctors Bansal Classes on its 31stanniversary has initiated a campaign named “Meri beti-Chalo Doctor Banaye” over 27 cities under which Bansal Classes will be committed to teach 50 girls students free of cost for AIPMT at each centre and Chandigarh centre will follow suit. These students will be selected as per their financial background and academic scores. 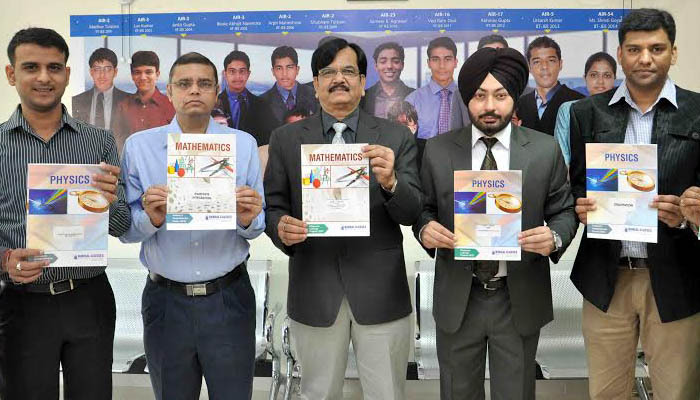 Bansal Classes, known for its institutes in IIT-JEE and Pre-Medical test prep segment launched its Chandigarh study centre here today in Sector 34. On this occasion local administration and representatives from Kota head office were present to unveil Bansal Classes the plan of action for tricity. Chandigarh center will be conducting an open session for students on 23 Novemberwhere students can join and ask for their doubts related preparations of IIT-JEE, AIPMT and other entrance examinations. Mr. Ambrish Kumar Tiwari, IT & Legal Head, Bansal Classes Private Limited, said that to have its centre in Chandigarh was long awaited for Bansal Classes, adding Chandigarh has produced various rankers and IIT selected students and as per the demand of time it is a part of long term strategy for Bansal Classes to come down to city and provide best education to students under its flagship courses. On this occasion Mr. Tiwari told that their overall objective will be to have quality education for each and every student and they are committed for this. “To execute our promises for Chandigarh we are prepared to put large level resources and send best faculties and administrative resources from Kota”, he said. Mr. Balwinder Singh, Centre Head at Chandigarh told to press that Bansal Classes has been proving its quality of education delivery for last 31 years and will be able to maintain the same standards for Chandigarh also. He informed the first entrance test for IIT-JEE and AIPMT courses will be conducted on 30thNovember for which students can apply online or by visiting centre. Mr. M.V.H. Kishen, Business Development Manager, Bansal Classes Private Limited, Kota told that the organisation is taking expansion very seriously and working on a PAN India Plan, other that Chandigarh various other centres in the region of northern and eastern Indian are under process of being launched where Bansal Classes will be maintaining best standards of teaching practice in commensuration with Kota headquarters.